By Dan Ambrose: After pursuing Bernard Hopkins (52-5-2, 32 KO’s) for the past three years without any luck, “Bad” Chad Dawson (30-1, 17 KO’s) has finally cornered him and will be facing him for his newly won World Boxing Council (WBC) light heavyweight title on October 15th at the Staples Center in Los Angeles, California. 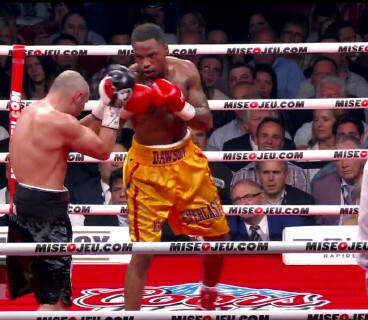 Hopkins just finished beating WBC champion Jean Pascal to capture his title on May 21st. That win has got more than a few boxing fans drinking the kool-aid thinking that Hopkins will beat Dawson next. I’m not one of them, however, because nothing has changed with Dawson’s excellent skills other than them getting a lot better now that he’s being trained by legendary trainer Emanuel Steward. Even before Steward altered Dawson’s fighting style, he was a very bad match-up for the 46-year-old Hopkins because of Dawson’s cat-like reflexes, his excellent boxing skills and his tendency to fight on the outside where Hopkins is very mortal. Dawson is going to give Hopkins all kinds of problems with his jab, left hook and speedy combinations. Hopkins likes to mug his opponents in close, but you can’t do that with Dawson because he doesn’t let his opponents crowd him. When they do, he fires off a blistering flurry of shots that backs them off. Hopkins will find it next to impossible to get in close to do his usual wrestling and punching on the inside. Dawson looked incredible in his last fight against Adrian Diacanu, beating him by a lopsided 12 round decision and rarely getting hit. The only time Diaconu could really land any shots is when Dawson would get bored after dominating for many rounds. But as soon as Diaconu landed a small handful of punches, Dawson pulled away and went back to dominating like before. Dawson has made other older fighters like Glen Johnson and Antonio Tarver look old in beating them both two times a piece in recent years. I see the same thing happening with Hopkins. Dawson will out-box him, win a decision and Hopkins will have to try and fight him again to try and prove that the win was just a fluke. Dawson will beat him again, and Hopkins will have to move on to softer targets.